The Trump administration’s rejection of Plains All American’s request for an exclusion to the administration’s tariffs on imported steel – which the company planned for a pipeline out of the Permian Basin, the nation’s most dynamic oilfield – illustrates the head-on collision between trade policies and energy goals. Caught in the middle: American consumers and U.S. energy security. We warned there could be significant problems for domestic energy from those tariffs and quotas on imported steel. We also flagged looming problems in the Commerce Department’s confusing, opaque process to decide when those restrictions would be waived in individual cases. 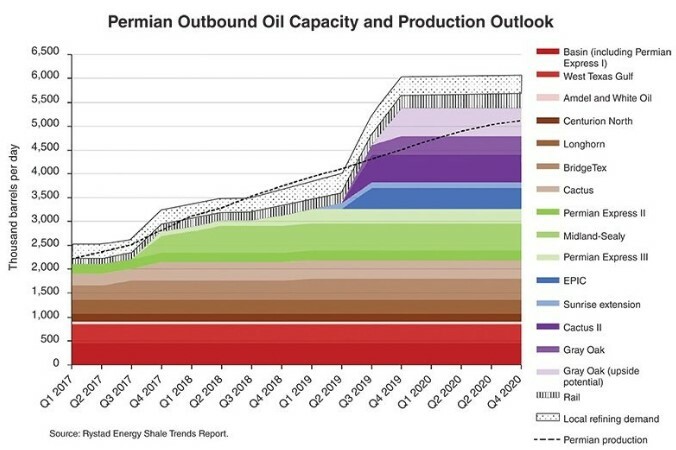 In the graph above from the journal article, you can see the Cactus II pipeline (dark purple) was projected to be a significant help easing the Permian infrastructure bottleneck. Now there’s significant uncertainty with the project. Reportedly, Commerce has received more than 26,000 requests for exclusions but has made final decisions on only a tiny fraction of those. Other natural gas and oil companies are awaiting decisions from the government, which means that to some extent, other projects are waiting, too. Right now, the White House has a critical opportunity to avoid years of damaging impacts to American businesses and consumers by undoing these serious tariff missteps. It’s already clear that this well-intentioned policy will actually make the United States less competitive, undermine this administration’s vision of energy dominance and the manufacturing renaissance, and almost certainly destroy many more jobs than it protects. Natural gas and oil are leaders in driving economic growth, creating jobs and increasing U.S. security. The administration’s tariffs policy is wrong for American energy, putting these benefits – growth, jobs and security – at risk.